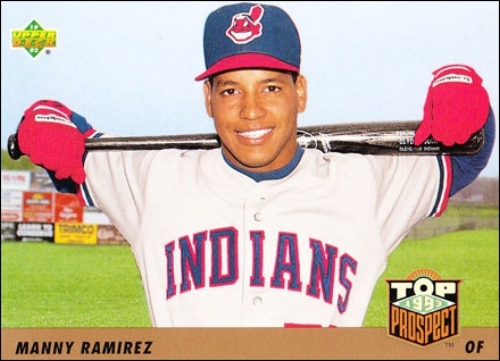 On September 3rd, 1993 (24 years ago today), Manny Ramirez put together quite a game. He collected his first hit—a double—and belted two home runs. Baseball America had the young outfielder ranked as the 13th best prospect before the '93 season. Even at 21, Manny had some serious swag; he thought his first hit was a home run and kept running. 15 years later and in his last season in Boston, Manny joined the 500 homer club on May 31, 2008. He ended his MLB career with 555 homers: 274 with Boston, 236 with Cleveland, 44 with the Dodgers, and 1 with the White Sox. He's not done playing baseball. Now 45, he hit his first Japanese homer earlier this spring.